A smaller show of cattle was forward. Limousin 199.5p, 189.5p Nether Onsett. Angus 178.5p, 169.5p Low Hallburn. Limousin £1,411, £1,356 Nether Onsett. Angus £1,053, £1,017 Low Hallburn. A larger entry of 201 spring lambs was forward. Many more could be sold to advantage, especially lighter weights 32kilos plus. Heavy lambs gain no premium. 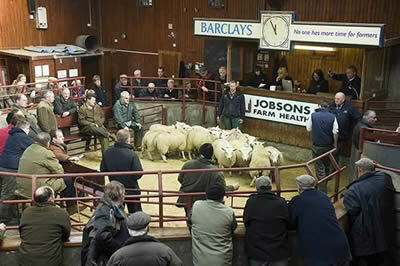 Top price of £97 per head for Suffolks from North Cowshaw and The Land, and to 251p per kilo for Texels from Trawill. Texel 251p Trawill, 230p Low Hallburn, 221p Hermitage, 220p Guardsmill, 211p Hermitage. Suffolk 200p Low Hallburn and Kimmeter Green, 195p Kimmeter Green, 193p Mossband Hall, 192p The Land, 190p North Cowshaw. Suffolk £97 The Land and North Cowshaw, £95 Guards, £93 North Cowshaw, £88 Kimmeter Green, £85 Mossband Hall, High Balgray and Kimmeter Green. Texel £91 Guardsmill, £89 Rottington Hall, £88 Trawill and Hermitage, £86.50 Upper Brydekirk, £86 Hermitage and Mossband Hall. Another large show of 4,738 prime hoggs was forward to the usual ring of buyers. Trade was similar on the week, although a two tier trade was evident between well fleshed hoggs and plainer sorts. Heavyweight hoggs as dear as seen for a good few weeks. 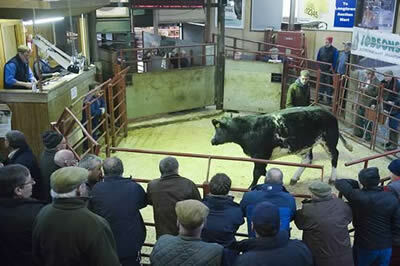 The sale averaged 181p overall (SQQ 185.7p). Top price per head was £100 per head for Texels from Mossband Hall & Glenzierfoot and to 213p per kilo for Beltex from Uppercleuch. Beltex 213p Uppercleuch, 205p Nether Brotherstone, Hollands and Waterside, 203p Uppercleuch. Hill Cheviot 211p Becks, 210p Mid Harrietsfield, 205p High House, 202p Mid Harrietsfield, 198p Pennersaughs. Texel 210p Newington, 202p Chapel Farm, Crawthat and Hermitage, 200p Hillview Court, Netherplace and Nether Brotherstone, 199p East Raffles, 198p Oakshawhill and Becks. North Country Cheviot 200p Station Yard, 189p Pityot, 184p Braes of Enzie, 177p Pityot, 176p West Logan. Suffolk 194p, 189p Edenhall, 188p Guardsmill, 178.4p Airds of Balcary, 177p Lanarkland. Blackface 193p, 191p, 189p Barlaes, 188p Glenshanna, Barlaes and Kirkhouse, 186p West Scales. Greyface 191p Airds of Balcary, 187p Whinneyknowe, 182p Allfornaught, 176p Newington, 175p Golden Lane. Charollais 186p Trewiston, 172p, 171p Netherplace, 167p, 166p Moss Side. Easycare 180p, 173p Castle Farm. Texel £100 Mossband Hall and Glenzierfoot, £99 Smerral, £97 Pityot, Guardsmill and Chapel Farm, £95.50 Lanarkland, £95 Hermitage, Braes of Enzie, Netherplace and Becks. Charollais £98, £87 Moss Side, £86 Netherplace. Suffolk £97.50 Lanarkland, £96, £95 Pityot, £94 Netherplace, £93 Lanarkland. North Country Cheviot £97 West Logan, £95.50, £95 Pityot, £92 Braes of Enzie, £87 Edenhall. Hill Cheviot £95 Yett Farm, £92.50 Bloan, £92 Chapel Farm, £91 Bidlake and Mossband House, £90 Wicketthorn. Greyface £90 Airds of Balcary, £89.50 Allfornaught, £87.50 Pityot, £87 Marygate, £83 Edenhall. Leicester £87, £82 Old Police House. Blackface £84.50 Barlaes, £84 Yett Farm, £81 Barlaes, £80.50 Braes of Enzie, £80 Pityot and Mossband House. Beltex £84 Waterside, £80 Nether Brotherstone and Hollands, £78 Waterside. Swaledale £65 Oswie and Gate Ghyll, £63 Oswie. Easycare £64, £63 Castle Farm. A larger show of 3,159 cast ewes and rams was forward to a full ringside of buyers. All classes of ewes remain dear apart from the heaviest fat end of the ewes. Rams maintained recent high rates. Many more could be sold to advantage. Texel £148 Heatherglen, £144 Chaseside, £141, £138 Heatherglen, £137 Westhills. Suffolk £140 Skelfhill, £130, £129 Heatherglen, £125 East Murkle, £124 Easter Dawyck. Charollais £138, £130 Heatherglen, £130, £127 Chaseside, £124 Beckfoot, £122 Heatherglen. Leicester £124 Orchard Mains, £119 Stonehall, £118 Hightown, £114 Kellah, £109 Easter Dawyck. Beltex £124 Graceside, £106 Bidlake. North Country Cheviot £114 Guardsmill, £108 Beckfoot, £104 Heatherglen, £102 Purdomstone, £100 Crawthat. Half Bred £110 East Murkle. Greyface £106 Holme House, £103 Awhirk, £102 Mossband Hall, £100 Heatherglen, £99 Stonehall. Zwartbles £104 Miller Hill, £103 Chaseside, £100 Heatherglen, £90 Westhills. Cheviot Mule £98 Falnash, £97 Skelfhill, £96 Mossband House. Dorset £98, £92, £83 Viewley. Hampshire £90 Croftheads, £88 Guards. Hill Cheviot £95 Upper Brydekirk and Crossdykes, £92 Craighousesteads, £86 Effgill, £85 Skelfhill, £84 Falnash. Blackface £93 Kellah and Purdomstone, £90 Clonrae, £84 Wanwood Hill, £82 Kellah, £80 Clonrae Pityot. Lleyn £85 Barmagachan, £82 Mallsgate Hall, £76 Guards, £68 The Hills. Swaledale £82 Taylorburn, £81 Sanders Close and Softley, £79 Merry Knowe, £77 Butterdales and Hightown, £76 Hudgillrigg and Settereth Park. Easycare £80 Scales, £77 Morebattle Tofts, £75 Scales. Herdwick £76 Carwath, £69 Longrow, £67 Scales, £66 Butterdales. Texel £188 Newlands, £178 Beckfoot, £174 Medomsley, £169 Balgerran, £168 Heatherglen. Leicester £179, £174, £169 Kellah, £136 Hudgillrigg, £132 Orchard Mains. Suffolk £160 Boreland, £146 Heatherglen, £142 Golden Lane, £129 Bidlake, £122 Nether Brotherstone. Charollais £154 Moss Side, £148, £146, £136 Heatherglen. North Country Cheviot £148 Heatherglen, £137 Bidlake, £121 Effgill, £118 Heatherglen, £112 Chaseside. Dorset £120 Airds of Balcary, £100 Beckfoot. Hill Cheviot £108 West Millhills, £104 Boreland, £94 Crosslee, £93 Oliver Road. Blackface £104 Westloch, £94 Maidencots, £92 Orchard Mains, £90 Whitchester, £89 Low Eals.